Many of my clients have costume jewelry, sunglasses, and other accessories that don’t necessarily have to go into a safe but are beautiful show pieces worthy of display. This glass showcase I designed allows my clients to have the jewelry store feel right in their home. The base is made of wood, the interior lining of a soft suede that smoothly pulls out for full access and is finished with a clear glass crown top piece. 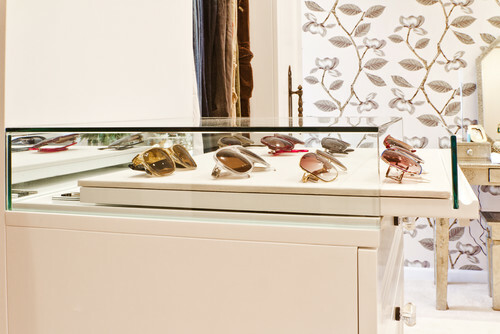 Not only is the jewelry display an aesthetic accent, it is fully functional – allowing clear visibility of all your pieces. The inspiration behind the jewelry showcase comes from my childhood, spending lots of time in my father’s jewelry store. The jewelry he designed and sold was always so properly displayed, on lush fabrics under perfect lighting. I have admiring and loving feelings of those times that I’d love to transcend into my work. The jewelry showcases are available by custom orders and can be made to fit any size and material. The article below is a translation from Dutch into English.